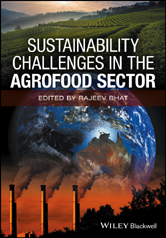 Sustainability Challenges in the Agrofood Sector covers a wide range of agrofood-related concerns, including urban and rural agriculture and livelihoods, water-energy management, food and environmental policies, diet and human health. Significant and relevant research topics highlighting the most recent updates will be covered, with contributions from leading experts currently based in academia, government bodies and NGOs (see list of contributors below). 2.4 Global Land Grabs or Agricultural Investment? 5.4 Sustainability in Grain Production in South Asia: Can self‐sufficiency be the key? 12.2 Crop Varieties, Cultivars or Landraces?